Okay, so this is a very quick review of the Samsung Galaxy i7500 mobile phone considering my few short minutes with it. 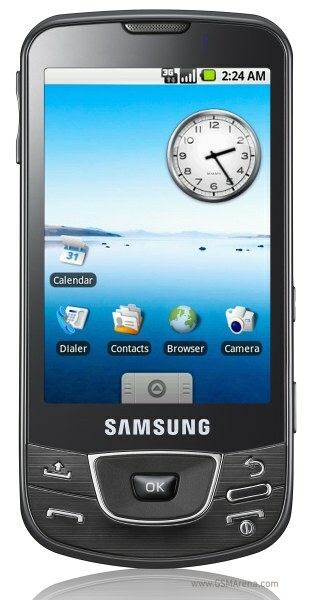 The Samsung i7500 Galaxy is the first Android phone that I have handled (prior to the HTC Hero). I really don't like the design of the Samsung i7500, everywhere you look is plastic so the phone doesn't really scream STYLE. The whole device is also a fingerprint magnet. However, the 3.2 inch capacitive screen is very pleasing to look at considering that it's an AMOLED screen. I just wish that Samsung skinned the Android interface a bit and added a more colorful wallpaper in order to make full use of the vibrant LCD. Since the Samsung i7500 Galaxy is my first Android phone to hold, it took a while before I got used to it. Of course, I've seen some videos of the HTC Magic in action but handling the real thing is different. Swiping through the 3 menu screen is really fast, definitely as fast as the iPhone (3G). It's the menu buttons that took me a while to figure out. I had a hard time finding where was the WiFi, GPS, etc. However, even though there's a small learning curve for first time Android users, the Android OS is something else. Thanks to the iPhone, Google made sure that the Android OS is first and foremost for touchscreen phones (esp. the 1.5 version). The Samsung Galaxy has a 5 megapixel camera with autofocus and geotagging. There's also an onboard 3.5mm headset jack although Samsung didn't scrap out their proprietary connector since you still need that for charging. What I hate about Samsung is why don't they have just one proprietary connection for ALL their mobile phones so that it would be easy to borrow a charger if your other friends have Samsung phones. My Samsung Omnia has a different connector than the newer Samsung phones which is a REAL pain. That's the reason why I only have had a short time with the i7500, the unit ran out of battery and I couldn't charge it with my Omnia's charger because Samsung decided to make their proprietary connector smaller. Anyways, going back to the Samsung i7500, there's also an accelerometer which by the way, has a very smooth transition, Bluetooth with A2DP, 3G/HSDPA, 8GB internal storage expandable with a microSD card up to 16GB. The downside/disadvantage of the Samsung Galaxy i7500? No FM radio, and no DivX compatibility which is a bummer really considering that the AMOLED screen is best used when viewing high quality DivX movies. Some of my other Samsung mobile phones have issues with the volume of the speakers, the Samsung Galaxy phone has good speaker audio quality but again, it's not loud enough for me. If you already have the Vodafone Magic, I really don't see any compelling reason for you to switch except for the 5 megapixel camera and onboard 3.5mm headset jack. Other than that, both sport the same Cupcake OS. Since the Samsung i7500 Galaxy has the luxury of being released first than the HTC Hero, those who can't wait for the latter might want to grab the Samsung i7500 now, unless of course, you feel that HTC's Sense UI is worth the wait for the HTC Hero. "What I hate about Samsung is why don't they have just one proprietary connection for ALL their models so that it would be easy to borrow a charger if your other friends have Samsung phones." Our troubles would be over soon as the manufacturers have signed an agreement about the MicroUSB being the connection of choice for ALL phones. Word has it that the Samsung Galaxy would be released by O2 in the UK around July 27th. The one I've gotten my hands on has a proprietary port. It may be that Samsung changed the port to a microUSB on their newer units in compliance with their agreement with EU Parliament. HTC already did that with their newer Pro2s on other networks. It's a welcome change. "make full use of the vibrant LCD"
It's not an LCD its an OLED. OLED is a totally different technology. LCD works by blocking light from a backlight, hence the blacks aren't great because they can't block it 100%. OLED makes its own light - so black pixels are really black as they don't make any - hence really great colours. Can anyone tell me which is the better - the Samsung Galaxy, or the Jet? I had my heart set on the Jet, but just saw this one in a shop and now don't know which to get! Which is more recent etc?